It’s safe behind the camera. There’s enough stuff to think about–aperture, shutter speed, framing–that I can usually stay somewhat detached from the emotion in front of the lens, be it grief or anger or levity. But what usually occurs at a professional distance has a bad habit of sneaking up on me later. So it was in Hiroshima. 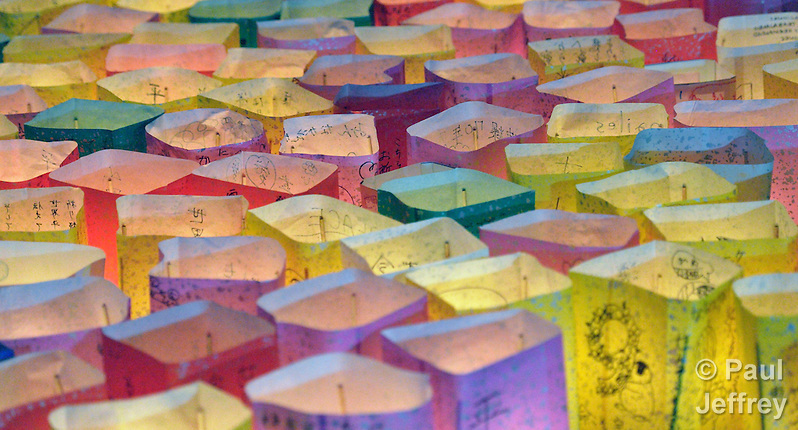 I’d been photographing the tens of thousands of people who came to ground zero, bringing countless strings of paper cranes, their prayers for peace, and in some cases bringing their elderly loved ones who survived the blast. It was good visual content, so I clicked away, not thinking much about that clear morning 70 years ago when my country dropped a bomb that rent open the sky over Hiroshima with a nuclear fireball that engulfed not just the city, but all of modern history. And then three Japanese students, in their early teens, dressed in neat school uniforms, approached me and asked in unpracticed English if they could ask me some questions for a school project. Sure, I said. They had to read the questions from a survey form, and in a few cases I helped them with pronunciation. Where was I from? Did I know about the bomb? Those were easy questions. And then they asked if I thought it was right that the U.S. dropped the bomb on Hiroshima. Easy answer: No. But as I started to say the word, I choked on it. Not because I had any doubt. 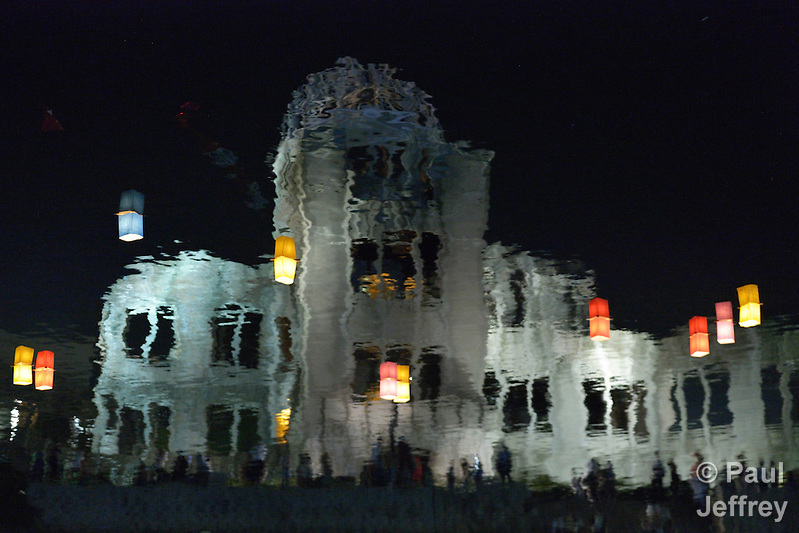 But because of the faces of the three students were the faces of Hiroshima. It was they who died in 1945. It was they who we have killed over and over in the decades since with our self-serving deceptions about why it’s necessary to build and use nuclear weapons. I got through the rest of the survey, barely. Then I went and sat for a while beside some Buddhist monks who were drumming. These moments creep up on you. A few days later, in Nagasaki, I was riding a tram through town to the main museum about the bomb’s effect on that city. The tram was filled with little kids on some sort of school outing. Some of the boys were falling asleep, their heads gently bouncing from side to side as the old tram swayed back and forth. Some girls were sneaking glimpses at the foreigners and then laughing among themselves. They all had some sort of paper with little boxes where they apparently collected stamps from different stops along the way on their field trip. When we got to the museum, I walked slowly through it. I’m not a big museum fan, so I sort of floated by the dioramas of devastated landscapes and collections of tattered and burned clothing. And then I came to several side-by-side video screens showing the faces of those who died in Nagasaki the day we dropped the bomb. There were portraits of old people, youth, workers, women, and a lot of children–pictured in their school uniforms, probably their official school portraits. As I looked at them, I saw the kids on the tram, the sleeping boys, the giggling girls. And once again I had trouble breathing. Covering the 70th anniversary of the bombings wasn’t a matter of documenting a bunch of people remembering some stale historic event. 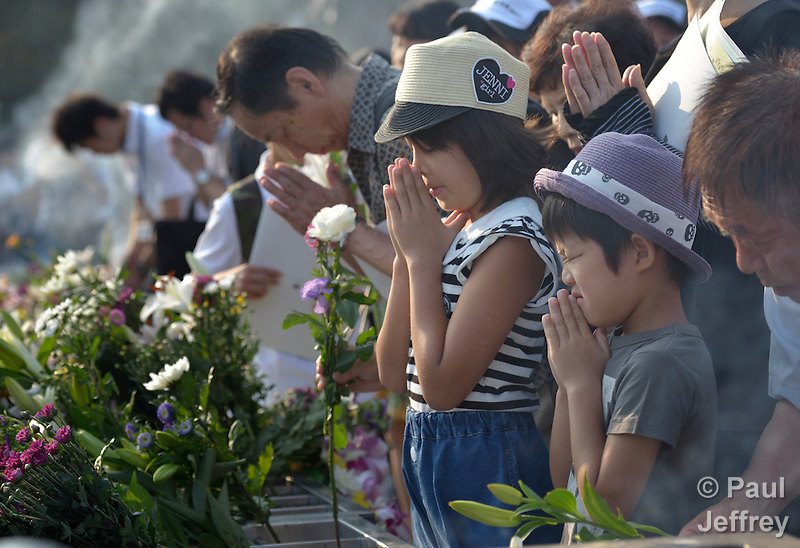 The tens of thousands of Japanese who came to pray for peace at the two sites made the journey because they still feel the trauma and they still fear its repeat. This wasn’t old news I was covering. This is what’s happening today. Although polls show that 80 percent of the Japanese support Article 9 (it has, after all, kept them out of a lot of stupid wars over recent decades, unlike “normal” countries), conservative Prime Minister Shinzo Abe is trying an end run by “redefining” it, allowing Japan to join in regional “self-defense” pacts. He has also removed legal restraints on arms exports; earlier this year, the country’s first-ever military trade fair took place in Yokohama, featuring the deadly wares of companies like Mitsubishi and Kawasaki. 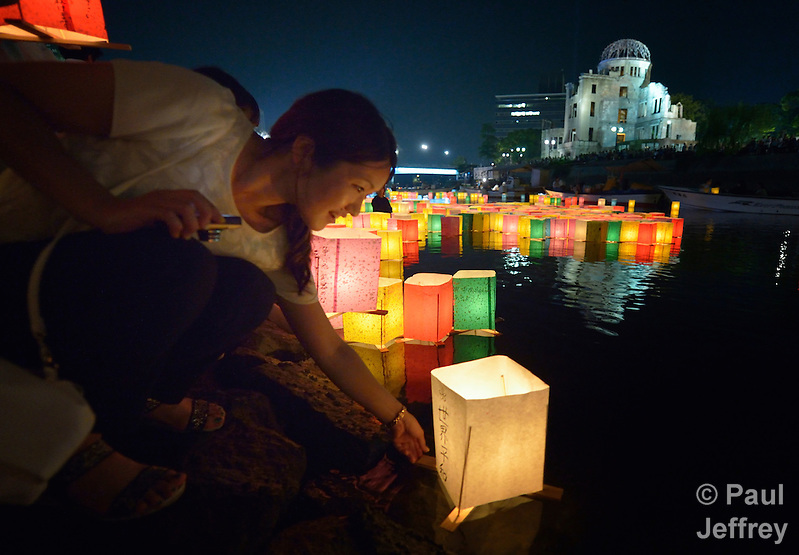 Abe showed up at both the ceremonies in Hiroshima and Nagasaki, and he was greeted with silence. By contrast, Sumiteru Taniguchi received enthusiastic applause, several times, when he spoke to the ceremony in Nagasaki. Now 86, he was a 16-year old postman when the bomb exploded over Nagasaki, literally blowing him off his bike and landing him in the hospital for more than three years. He still moves slowly, the result of his injuries then. When Abe addressed the crowd there was no applause. A few protestors who held up signs or shouted objections were quickly quieted by security agents. Although Abe proclaimed that Japan would lead the movement to ban nuclear weapons—something he’d been criticized for not stating at the ceremony in Hiroshima three days earlier—abolitionists and many of Japan’s neighbors simply don’t trust him. Taniguchi is a hibakusha, the term the Japanese use for someone who survived the atomic bomb blasts. 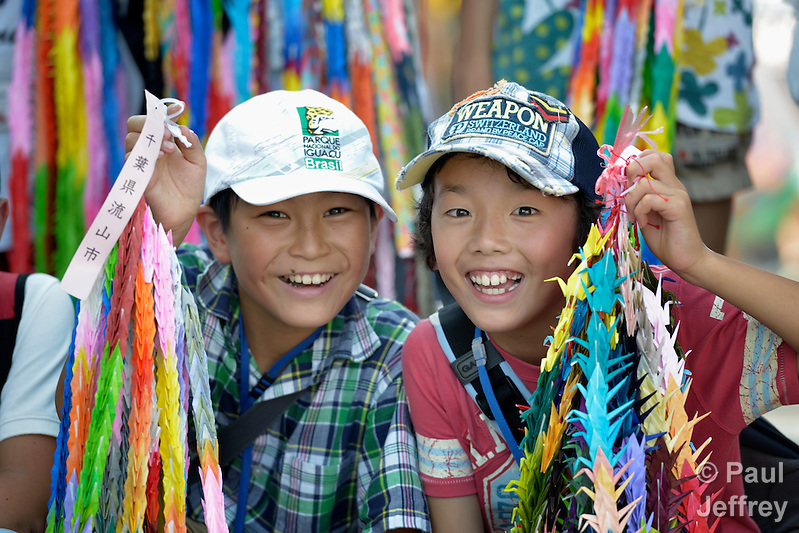 The average age of the hibakusha is now over 80, and there are less and less of them every year. As their collective voice grows dimmer, proponents of violence find it easier to control the debate. So a new generation must take up the cause. 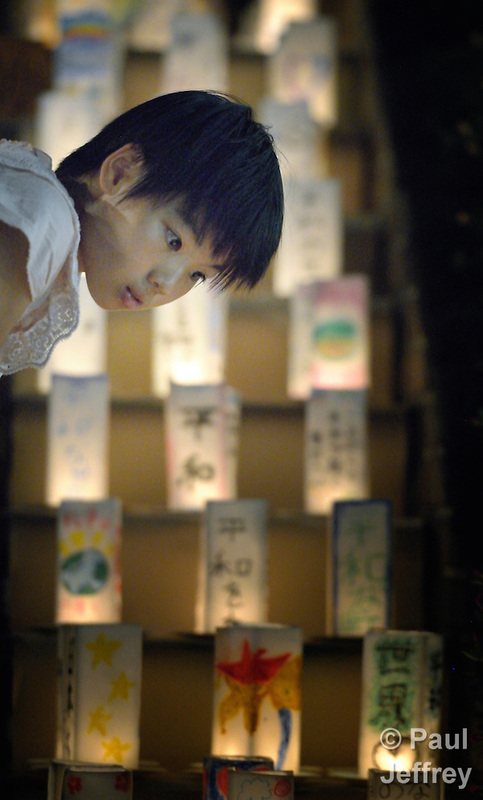 When I think about the people I met in Japan who brought prayer and flowers to the memorials, who brought floating candle lanterns to the rivers, they were largely a young crowd. That gives me hope for Japan, no matter Abe’s saber-rattling. Water, by the way, was a constant element in the anniversary commemorations. When the bombs exploded, the intense heat scorched the cities underneath, and those who survived were left with intense thirst. Those who could walk moved toward the rivers, seeking relief from their thirst. Yet they found the rivers choked with dead bodies, debris, and fatal levels of radiation. And as the tide came in, salt water only exacerbated the pain of their wounds. As a result, memorial ceremonies today usually begin with a symbolic offering of buckets of fresh water for the victims. 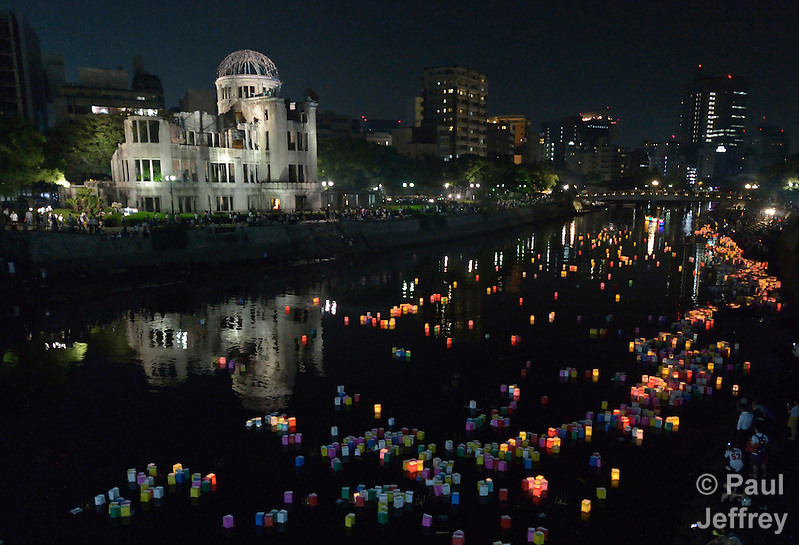 And when thousands of people set their floating candle lanterns on the river in Hiroshima, they did so remembering their family members who had sought in vain for water to soothe their burning flesh and cool their parched throats. Just as Japan wrestles with remilitarization, a similar dynamic seems to define how we view nuclear weapons at an international level. From a peak of more than 70,000 nuclear warheads at the height of the Cold War, political leaders–starting with Reagan and Gorbachev–have walked the world a ways back from the brink. Today we have “only” 16,000 nuclear warheads. The United States and Russia possess 94 percent of those–1,800 of which are on “hair trigger alert,” ready to launch on a moment’s notice. Although the media fill ample air time with stories about the alleged pursuit of nuclear weapons by Iran and North Korea, they aren’t the real danger. We are. We are the danger because even if the weapons are never “used,” their production costs lives and livelihoods everywhere from the uranium mines to the final assembly plants. The hibakusha are all around us. And we’re incredibly lucky that the weapons have not been used again by “accident”–such as in 1995 when Russian officials mistook a Norwegian weather rocket for a U.S. submarine-launched ballistic missile. Boris Yeltsin’s senior aides told him the country was under attack and that he had to launch hundreds of nuclear-tipped missiles at the U.S. Yeltsin became the first Russian president to ever have the “nuclear suitcase” opened in front of him. But he trusted U.S. officials, and with just a few minutes to decide, Yelstin concluded that the radar reports were in error. The suitcase was closed. There are certainly other weapons of mass destruction. Yet the international community has made things like biological and chemical weapons, cluster bombs and land mines illegal. That doesn’t mean they are not ever used, but combating them is certainly easier when there’s a legal framework proscribing them. That’s not the case for nuclear weapons, though a move supported by well over 100 countries is pushing for a “humanitarian pledge” to ban the weapons and close the “legal gap” by declaring them illegal. Russia and the U.S., however, rather than joining the pledge, or even continuing to reduce their arsenals, seem intent on the opposite. As warheads and delivery systems are aging out, both nations are investing huge sums in modernizing their nuclear arsenals. The Obama administration is preparing to go on a trillion-dollar spending spree on nuclear weapons. The self-described fiscal conservatives in the Congress aren’t objecting; most have never seen a weapons contractor they weren’t thrilled to throw money at. One can hope that Pope Francis, who earlier this year declared that “spending on nuclear weapons squanders the wealth of nations,” will speak forcefully to the issue when he visits the U.S. next month. The church in Japan–from the unique perspective of the only people who have had the weapon dropped on them–has spoken consistently against nuclear weapons development and production. 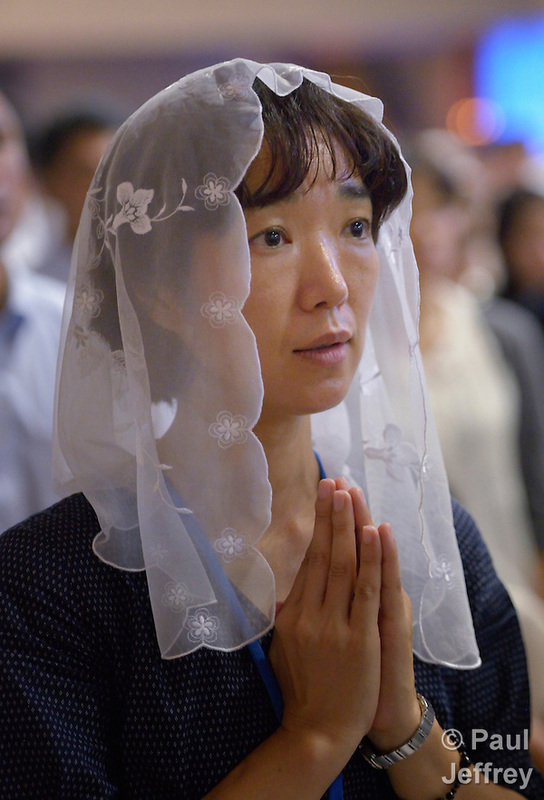 And at the same time it has taken the lead in confessing the role that Japan played in creating World War II, and noting the church’s complicity in nationalism and violence. In 1967, for example, the United Church of Christ in Japan confessed that it was sinful to have aligned itself with the military and prayed for victory during the war. The church said it should have criticized government policies. This statement was important in several ways, in that the UCCJ had been formed with government encouragement; setting itself apart from government policies marked a maturation of the denomination’s sense of independence and faith. In 1986, the country’s Catholic bishops apologized for their complicity in the war. And in 1996, the Anglicans in Japan issued a formal apology for complicity with imperial aggression, and recognized that the belated nature of their confession mandated a complete reexamination of their understanding of their own mission. 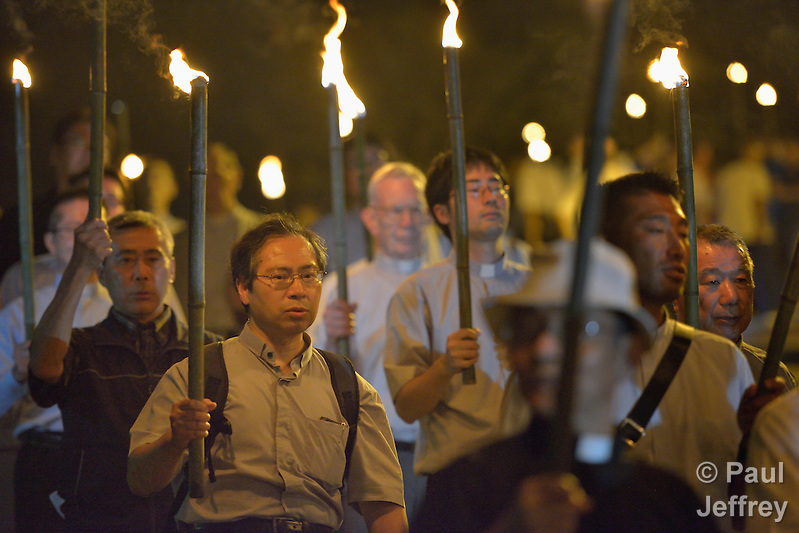 I went to Hiroshima and Nagasaki to provide visual documentation of a pilgrimage to the two cities by a delegation of church leaders from the World Council of Churches. One of the delegation’s stops was a ceremony at a small memorial for the Korean forced laborers who were among the thousands of foreigners (including U.S. and Allied POWs) who were killed in Nagasaki by the atom bomb. That such a memorial exists in Japan is noteworthy, though it is across a street from the main memorial and tucked back in the shrubbery a bit. 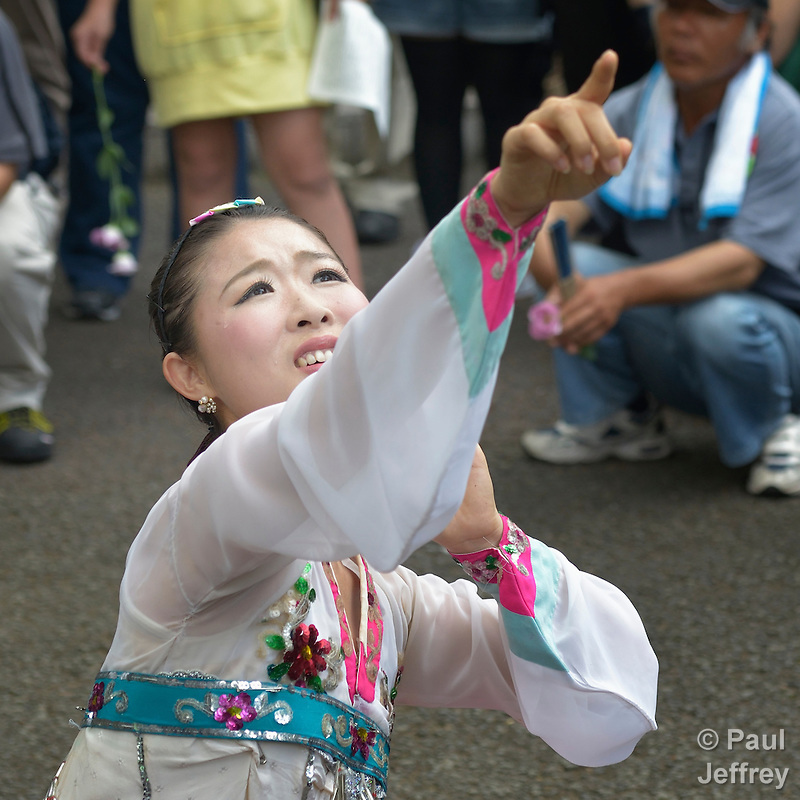 Here’s Kim Myosu, a Korean-Japanese dancer, looking with fear to the sky as she performs during the ceremony honoring the Korean victims in Nagasaki. For reactionary politicians like Prime Minister Abe, talk of Japan’s wartime sins is political hogwash, and he has been slowly walking the country back from any sense of remorse about Japan’s imperial aggression, provoking criticism from neighboring countries that suffered under harsh Japanese rule. Abe has made it clear he’s tired of apologizing. His strident nationalism may have gone too far, however. Just today–the 70th anniversary of the day his father Hirohito announced Japan’s defeat–Emperor Akihito, who by law is prohibited from making political statements, voiced his “deep remorse” for the “tragedy of war.” It was the closest thing to an apology ever to be voiced by the emperor. As I remember the faces of those young Japanese students in Hiroshima who asked me to help with their survey, and those Japanese children riding the tram in Nagasaki on a school field trip, I ponder my own complicity in a world where we have built so many weapons of mass destruction. I remember the few steps I have taken to work for nuclear disarmament, even getting arrested. But it all seems so timid now. If we’re going to take seriously the challenge that never again will nuclear weapons be used, that we must stop their production and stockpiling now, then a deeper commitment is called for. As Sumiteru Taniguchi, the old hibakusha, said, “We cannot accept this.” We must claim his words as our own. 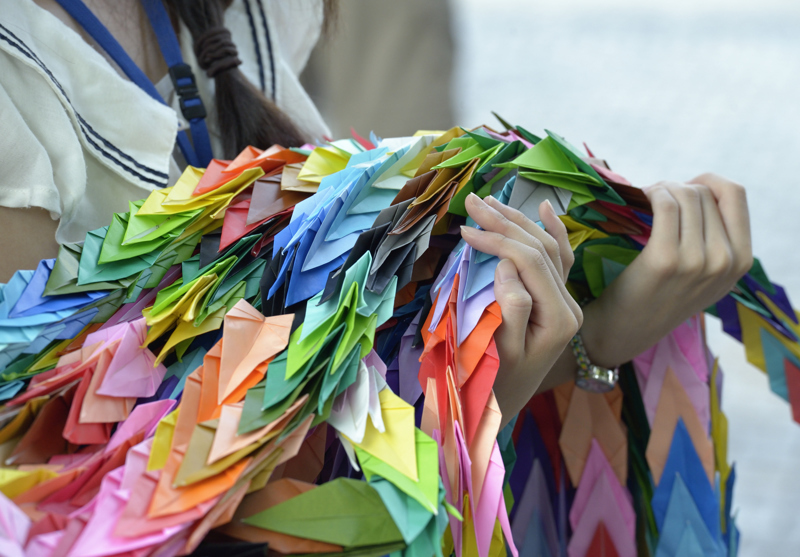 Finally, one of the songs that a large children’s choir sang during the main ceremony in Nagasaki was “A Thousand Paper Cranes,” by Kanae Yokoyama and Michuru Ohshima. Here’s the translation, and a photo of a small portion of the choir. Let’s all fold rainbow-colored cranes. I fold a scarlet crane. I fold a fresh white crane. I fold a purple crane. I fold a yellow crane. for the people sunken in the water’s depths. I fold a grass green crane. I fold an indigo crane. gazing with hope and dreams to the future. I fold a rainbow-colored crane. August 15, 2015 | Filed under Asia, Blog, Church, Disasters, Environment, Faith, War.